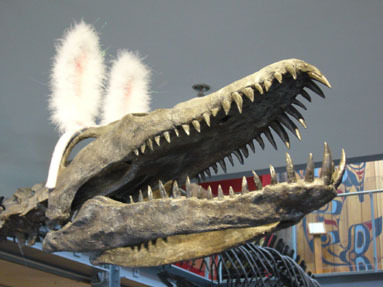 Mark Saturday, April 6 on your calendar as our annual family event is scheduled from 11am to 2pm here at the museum. Lots of new activities in store as well as some tried and true favourites (petting zoo alert!). 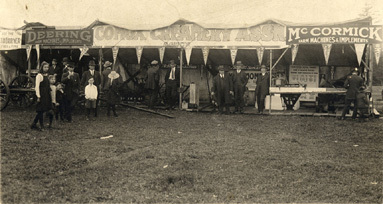 Creamery booth at fair, 1920s. CDM 988.225.14. The Comox Co-operative Creamery Association reaches the end of a 118 year long story with the imminent closing of the Courtenay Saputo dairy processing plant. But it's not the end for the Valley's dairy farmers whose milk will now be hauled to the Island Farms plant in Victoria. 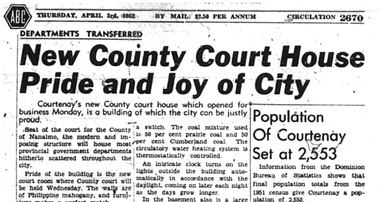 Courtenay's Court House officially opened on Monday, March 31, 1952. The building housed provincial government departments as well as the RCMP. This article from the April 3, 1952 Comox District Free Press gives all the details right down to the coal mixture used for heating (that's 50% Cumberland coal, in case you were wondering). Click here to read about the first inmate in the cells. The soldier settlement of Merville consisted of more than just farmland. By May of 1919 bunkhouses for single men, a cook house, office, stables and a general store had all been erected at the town centre along the Island Highway under the direction of the Land Settlement Board. By July there were fifty shacks up for settler families. North of Nurmi Road, the Erskine & May sawmill was in operation by 1920. 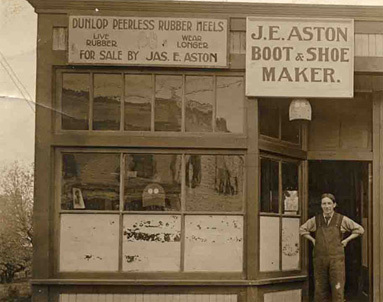 It seems that Erskine and May made quite a name for themselves in the area. Story goes that they had difficulty cutting a straight line and much of their lumber had an obvious taper. But it wasn't their reputation for wonky wood cutting that made them a topic in the BC Legislature. 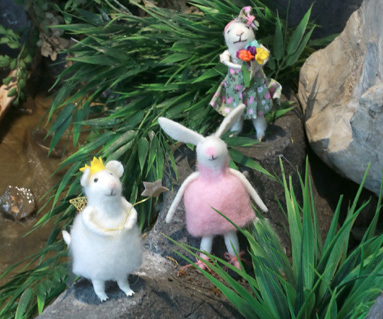 Adorable felt mice and rabbit figures that couldn't be any cuter if they tried. A great Easter gift for $14.95 each. Animal and bird themed cotton tea towels at 14.95 each. Gorgeous smelling soy candles made by Aroma Botanicals with the heady scents of Raspberry Champagne, Lavender Orange and Chamomile or Coconut Lime. $5.95 each. Spring is just around the corner so it feels like time for something light and airy. 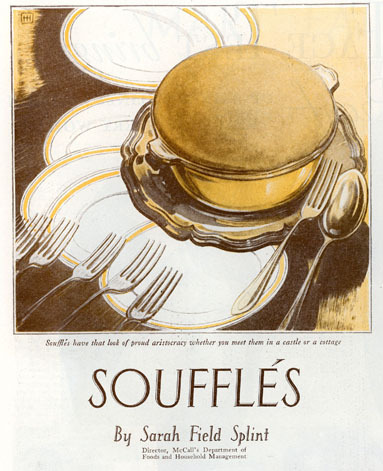 How about soufflés? McCall's magazine from March 1931 shares the secrets to this tricky dish. Helpful hints, recipes and practical "how-to" advice can all be found in periodical magazines from our archival collection. Photo credit: View of the empty corner lot of 5th Street and England Avenue, 1940, that would soon boast the E.W. Bickle Theatre. Charles Sillence photograph. Photo: CDM Sillence Collection. Page 147.